TOKYO – Thirty-nine Okinawa-based U.S. service members traveled to Tokyo July 14-22 to visit Japanese families, political leaders and national treasures and get a first-hand look at industry and cutting-edge Japanese technology as part of the 9th Annual Welcome Marine Program. The goodwill visit was sponsored by U.S.-Japan Link, a Tokyo-based philanthropic group whose aim is to solidify Japan and United States relations by allowing U.S. service members to experience Japanese culture. Reiko Tamura, the president of the WMP, started the program after she interviewed Marines on Okinawa in 1995. She said she was impressed by the Marines and their willingness to fight on behalf of Japan. “I had felt I should invite (Marines) to Tokyo, thinking that it would help correct misunderstandings about the Marines on our side, and that it might help the Marines to know (Japan better), which they are defending,” Tamura said. Over the years, the program grew to include sailors, soldiers and airmen stationed on Okinawa. 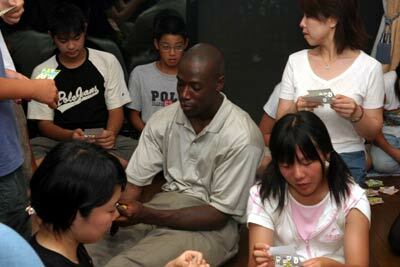 Service members spent a night with Japanese host families during their trip. One group of service members taught English numbers to children by playing bingo with them. 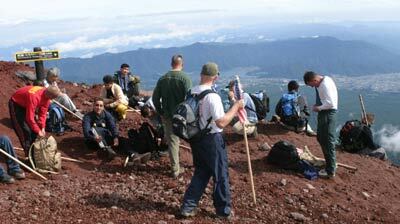 Participants climbed Mount Fuji at night with Gen Nakatani, the former secretary general of the Japanese Defense Agency, and members of the Japanese Ground Self Defense Force. Service members braved cold rain and high winds to reach the 12,395-foot summit of Japan’s national symbol and highest peak in time to see the sunrise. “It was one of those ‘glad it’s over but glad I did it kind of things,’” said Staff Sgt. Gregg T. Schwiner, a WMP participant from Marine Corps Base Camp Foster. Early in the trip, the group met with Liberal Democratic Party Secretary General Shizo Abe at the party’s headquarters where they talked about the alliance between Japan and the United States. They also spoke with the Marine Forces Pacific Commander Lt. Gen. Wallace C. Gregson and Japanese Maj. Gen. Noboru Yamaguchi, director of the research and development department, Japanese Ground Self Defense Force Research and Development Command, at a closed-door meeting where they spoke about the future of Okinawa and the relationship between the United States and Japan. The group also spoke to U.S. ambassador to Japan Howard Baker at a formal reception. Participants later toured the National Diet building where Japan’s legislative branch meets, and the Imperial Palace. On the cultural side, service members visited Kamakura City to tour the Tsurugaoka Hachiman Shrine and the Enkakuji Temple, which are places of worship for the Shinto and Buddhist religions. At the Enkakuji Temple, service members practiced Zen meditation, a part of Buddhism where one sits cross-legged with a straight back, focusing on perfect posture and concentrating on slow breathing. 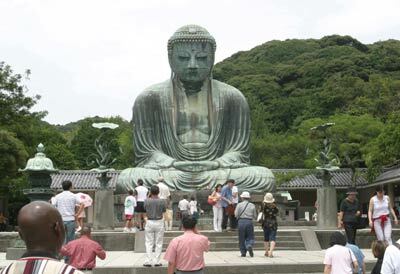 Service members also visited the 13.35-meter-high Daibutsu, or big Buddha, a statue of the religious idol in Kamakura City’s Kotokuin Temple. Participants learned about Japanese business and technology by visiting the Yamanashi Maglev test line to view a new train powered to 500 kilometers per hour by electro-magnets and visited the Toyota exhibition hall and assembly plant in Toyota City, Japan. “I think that, overall, everyone had a really good time on the trip,” Lucero said.